I'm so used to packing a bag with a MacBook, iPhone and iPad that the thought of yet another device to remember fills me with some dread. Don't get me wrong, I love my devices, but there is such a thing as overkill. It's like regressing back to a time when you had to carry around a paper diary, separate notepad and a few bulky binders – it's just too much. What mobile tech was supposed to give us were the all-in-ones – the ability to have all we needed in one device, taking us one step closer to the paperless office, lighter travelling and productivity nirvana. Well, it didn't really work out for me with the number of devices I seem to carry around. It's probably the same for you. As as exciting as the Apple Watch's tech is, I can see the detractors' point of view. But for me the Apple Watch is about to complete the ecosystem rather than add another layer of complexity to our increasingly hectic tech-centric lives. It's not so much to do with the watch itself, but rather our relationship to mobile devices. We've all hated hearing loud keyboard tappers, observing phone hogs that barely look up from their screens and seeing folk awkwardly jostle other people out of the way to snap a photo with their tablets. The answer to all these unfortunate lapses in decorum? A device that is more naturally part of us that all we really have to do is remember to put it on in the morning. What the Apple Watch will finally offer us is a way to connect up the most disparate parts of our tech lives without adding extra effort or time (appropriate huh?). At the Watch's launch Tim Cook said that new products often demand new interfaces, and over the years Apple's been streets ahead in defining and redefining what we come to expect from our interactions with computer technology. It brought the graphical user interface to the masses with the original Macintosh, the iPod scroll wheel, and of course, the Multi-Touch interface that helped define the modern mobile computing market. When it comes to dictating how we interact with technology no company does it better and the Apple Watch is the epitome of that. It's built on a number of natural user interface ideas that pack an incredible amount of functionality into an 'insanely small' gadget. It's far more elegant a solution than the original iPhone and iPod touch, where the home button always seemed rather awkward and unnecessary as a physical button. With the Watch though, the Digital Crown is must. The Watch's intended uses demand that the virtual controls are simply not enough. Take the maps app as an example, your finger is great for moving around, but it will obscure what you need to see on a screen that small. The Apple Watch is more than the sum of its parts and unlike other mobile devices, including Apple's, there's no single way to control it. A remarkable achievement when you consider it's come to life out a demand for wearable tech accessories, instantly limiting what we're already used to doing on our smartphones. The only real limit though is a failure to embrace this change of mindset. I'm sure that in just a few months after the Watch's debut we'll all be asking ourselves why smartphones and tablets were so impersonal. 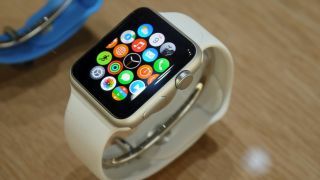 Because the Apple Watch is always on our wrists it makes the connection to our contacts far more immediate, even for things as mundane as reaching out to pick up your iPhone when it pings a message at you. That already feels like wasted effort. The Apple Watch is proof that less is more. Now our messages will be physically closer, easier to get to and more personal with features such as Digital Touch, where you can draw simple messages to other Watch wearers. You might think it's a novelty, but actually it's a sign of gestures finally growing up. We've never connected so intimately through mobile devices before. You can even send your heartbeat as a message. The Apple Watch will connect us like never before, not only thanks to Apple's intuitive user interface, but because a whole avenue for developers now opens up. An avenue for a device with so much freedom that it has more possibilities than iPad or iPhone ever did. As Thomas Edison once said: "Just because something doesn't do what you planned it to do doesn't mean it's useless." I'm sure we'll soon forget that it's a watch at all. Christian Hall is the editor of MacFormat magazine, the number 1 mag for Apple fans. For just £28.49 you can enjoy both the print and interactive digital edition of the mag for six months – a massive saving of 60%. Click here for more details.